During the past 300,000 years the summit of Mauna Kea has experienced at least four glacial episodes. The last, the Makanapa, covered the summit from about 30,000 to 9,000 years before the present. The image on the left shows a glacier similar to the ones on Mauna Kea. Such glaciers, such as this currently active one from the Andeas in South America, are known as ice caps. In the image, valley glaciers can be seen flowing down river valleys that diverge from the highlands. 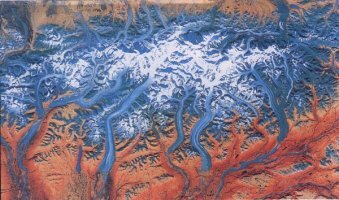 Note the manner in which these valley glaciers, as they are known, flow together like the merging tributaries of a river system. There is no evidence that the ice caps on Mauna Kea ever became large enough to have valley glaciers. Such glaciers carve U-shaped valleys, unlike the typically V-shaped valleys found near the summit of Mauna Kea. Mauna Kea is located in a tropical climate and does not suffer glaciation as frequently as mountain ranges in temperate zones. Even so, only a modest change in climate (5 cm more rain or a decrease in temperature of only about 1 degree C) would cause snow to remain throughout the summer allowing a glacier to form. 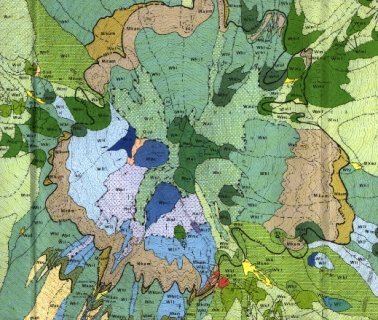 In this geological map, the lobate deposits circumscribing the summit are glacier till. If you look closely, you should be able to find four zones of glacial till, although the oldest is preserved in only a few sites on the South side of the summit. In the map the scalloped lines are of particular interest. They represent ice contacts where lava flowed against glacial ice during the most recent ice age. The Hawaiite flows chilled against the ice are especially fine-grained, and provided the ancient Hawaiians with an excellent source for the chipping of stone tools. Several quarries for the mining of this rock can be found near the summit along the ice contacts. The principle tool near these quarries was the adz. Consider the difficulties faced by a tropical, sea level people trekking to the cold and desolate summit of Mauna Kea, and remaining there for months mining and chipping stone tools. It is estimated the largest glaciers on Mauna Kea were no more than about 170 meters thick, and the last only achieved a thickness of 100 meters. Typically, glaciers begin to flow when they reach a thickness of about 50 meters. Clearly the ice on Mauna Kea was more than thick enough to begin flowing away from the summit, scuplting the rocks beneath into the forms typical for glaciated areas. This image shows the extent of glaciation during the last, or Makanapa glacial era. This was one of the smaller glacial episodes, but still the features carved into the cones and flows at the summit are impressive. Even more impressive are the massive morraines, boulders deposited at the terminus of a glacier at the elevation that the ice completely melts. 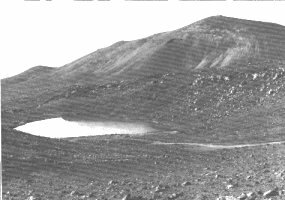 These deposits can be easily viewed on the road leading to the summit. Glaciers on the summit of Mauna Kea provide important evidence regarding the activity on the summit during the past few thousand years. The rate of eruptive activity should be particularly interesting to the operators of telescopes on the summit. In the image on the right, the light colored deposit surrounding the summit shows the extent of the Makanapa glacier. Within this region 8 unglaciated cones can be seen. These cones must have formed during the past 9000 years, since they are not gouged and disected as they would be if they were present at the summit during glacial activity. At face value, this would imply a near summit eruption rate of about once every millenium. In fact, most of these formed shortly after the end of the last glacial episode, so the the summit eruption rate is probably a few thousand years at the present. Cones present during glaciation are gouged and subdued, sometimes sufficiently dissected to show some of the internal vents that were active during cone formation. Eruptions of these cones were probably very violent and spectacular. It is likely that similar cones will form in the future, although this is by no means certain. Evidence for previous glacial episodes is found in this exposure in Pohakuloa Gulch. The two light layers in the section are glacial till. The top most is from the Makanapa episode. The next oldest glacial episode is overlain by a thick section comprised of multiple layers of hawaiite. Clearly lava flows from the summit are were common between 30,000 and 100,000 years before the present. The gorge was itself a product of glaciation. Melt water from the largest lobe carved this deep canyon which can easily be seen above Mauna Kea state park on the Saddle Road. Pohakuloa gulch can be clearly seen in the following photograph. One of the most impressive glacial features on Mauna Kea is the ring of light colored glacial till surrounding the summit. If the day is clear, this band of light till should be clearly visible from the corner of the geology building on the Hilo campus. This material is primarily the "terminal morraine" of the summit ice cap. As the glacier flows, rocks and debris are carred forward in the flow and deposited at the terminus where the flowing ice melts. The prominent V-shaped morraines just left of center in the photograph marks the head of Pohakuloa gulch. If you look carefully, several subdued terminal morraines can be seen at lower elevations. 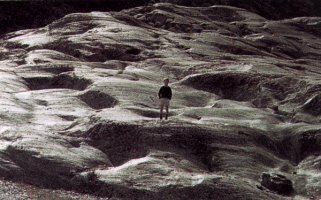 The glacial outwash, consisting of finely ground rock powder, which should be found in the saddle at the mouth of Pohakuloa Gulch has been buried beneath recent flows from Mauna Loa volcano. It should be noted that Mauna Loa should also have been covered by glacial ice during the last ice age, although all such evidence has been erased by recent eruptive activity. It would be interesting to core summit region of Mauna Loa. The thickness of recent flows over glacial till would provide important long term estimates of eruption rates on Mauna Loa during the past 10,000 years. 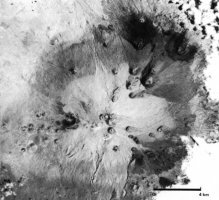 The material deposited in morraines is poorly sorted and angular. This is due to the way that glaciers transport debris without regard to size, shape, or weight. In fact, this angularity and poor sortedness is diagnostic of glacial till. 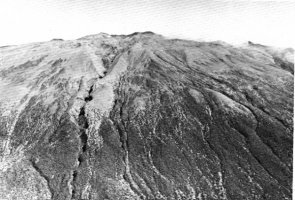 The image on the left shows a close-up of this material on the south side of Mauna Kea wrapping around a glacially carved cinder cone. One of the most enchanting features on the summit of Mauna Kea is the pristine Lake Waiau. Creatures such as the Weiku bug, found near Lake Waiau, are unknown anywhere else on Earth. If you look carefully in the grass around the lake you can sometimes find ladybugs, which is unusual at this elevation. I'm still wondering what they eat in this environment. 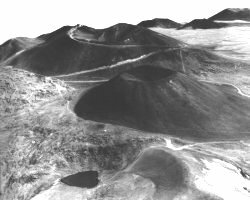 In this image, Lake Waiau can be seen occupying the summit of a carved and dissected cinder cone in the forground. By contrast, the cone immediately behind Lake Waiau is pristine and unglaciated. A ridge between the lake and this cone is one of the ice contacts where a lava flow ponded against a summit glacier. In the photograph, imagine the flow encountering ice in the depression currenly occupied by the lake. The ice contact is even more visible in the image on the left. If you get a chance, examine closely the bubbly, warped texture of the ice contact rocks above the lake. 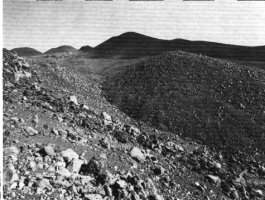 The slope leading up to the ice contact is covered with angular blocks of Hawaiite. My belief is that these rocks represent that part of the flow that overtopped the glacier and then fragmented into an angular breccia as the glacial ice was melted. Some geologists interpret this material as hialoclastic material, but I think this interpretation is in error. There are abundant evidence for glaciation on the summit of Mauna Kea. 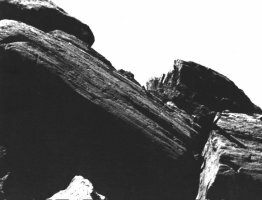 One of the most fascinating are the glacial striae formed as rocks embedded in the base of a glacial "scratch" the rock over which it flows. This photograph from the South side of Mauna Kea shows a large block of Hawaiite covered with striations. If you get a chance, examine the monument at the turn-in to the Hale Pohaku. There are, or at least were the last time I looked, clear glacial striations on the Hawaiite used for the monument. There is also abundant evidence near the summit of a kind of glacial activity known as "plucking". Since rock is very weak in extension, glacial ice flowing over a surface plucks rock from the down-flow edge of obstructions or resistant rock it is flowing over. This often results in a sculpted rock formation known as a "roches moutonnees". This is French for "rock sheep", which I imagine these features are supposed to resemble. Such formation are frequently seen on the summit road at higher elevations. Try to find some on the way up to the summit. The surface shown in the photograph on the right was not taken on Mauna Kea, but I included it here because it looks almost identical to the stripped a'a flows found near tthe summit. The steep slopes on the carved pattern clearly shows that the glacier was moving toward the left of the image. Perhaps such a concentration of "roches moutonnees" should be referred to as a "herd". I hope you enjoyed the trip! What was the source of the rock quarried by the ancient Hawaiian's for adzes? How does a glacier work? Describe in terms of zones of accumulation, ablation, brittle and flow. 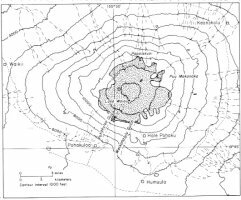 What geological evidence for glaciation is found on Mauna Kea? When did it occur?